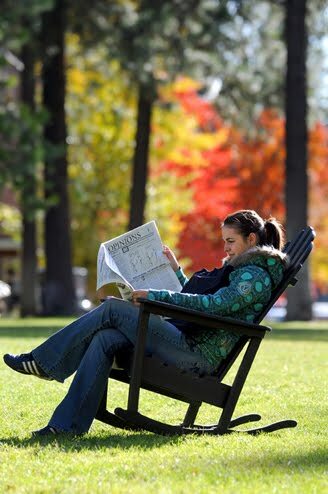 Whitworth's student-run newspaper, The Whitworthian, has won first place in its division at the 2009 National Mark of Excellence Awards, sponsored by the Society of Professional Journalists. The Whitworthian won Best All-Around Non-Daily Student Newspaper, beating out runners-up Abilene Christian University and the University of Arkansas. More than 3,600 entries for work produced during the 2009 calendar year were submitted from around the country to the national competition. Winners and finalists were previously recognized by receiving first place in one of the SPJ’s 12 regional competitions. Each first-place regional winner advanced to the national competition. Earlier this spring, The Whitworthian won first place in its category at the 2009 Region 10 Mark of Excellence Awards. The winners and finalists of the national competition will be recognized Monday, Oct. 4, at the Mark of Excellence Awards Luncheon, which will be held during the 2010 SPJ Convention & National Journalism Conference, in Las Vegas. "What a fantastic honor. This award, along with others we've received this year, has encouraged the entire staff as we strive to cover campus news with accuracy and integrity and to convey it to our readers in innovative ways," says Morgan Feddes, editor-in-chief of The Whitworthian. "This national recognition is the culmination of effort from both this year's and last year's staff, and it's great to see our work rewarded." The current newspaper staff includes Feddes, a junior, online editors Jerod Jarvis, a junior, and senior Danika Heatherly, as well as 15 editors and roughly 40 reporters, columnists, photographers, copy editors and graphic designers. "I'm extremely proud of the students who put out the newspaper," says Jim McPherson, associate professor of communication studies and adviser of The Whitworthian. "The staff works incredibly hard to produce an excellent newspaper. I'm continually impressed with how the editors view themselves as journalists, not just 'student journalists.' The staff members each year learn from and are motivated by the ones who came before. Morgan and this year's staff have done a wonderful job, building on the work of the editors of the past two years, Joy Bacon and Jasmine Linabary. McPherson continues, "It also helps tremendously that Whitworth’s administrators, from President Bill Robinson on down, are so supportive of the newspaper. They make themselves available for comment at times when administrators elsewhere might be inclined to ignore student requests, while still appreciating that the newspaper is a learning opportunity for the students involved. Administrators, faculty and staff at Whitworth respect the newspaper staffers as journalists and as students, and all of us involved with The Whitworthian are very grateful for that." The Whitworthian's online edition won the 2009 Associate Collegiate Press Pacemaker Award, considered the most esteemed honor in student journalism. The print edition was named a finalist for a Pacemaker award as well. In 2008, The Whitworthian took second place and in 2007 it took third place in the Best All-Around Non-Daily Student Newspaper category in the Region 10 Mark of Excellence Awards. In fall 2007, the publication took third place in "Best of Show" in the four-year weekly tabloids category at the 86th annual Associated Collegiate Press/College Media Advisors National College Media Convention. In spring 2007, the newspaper won the top award in the Inland Northwest Chapter of the Society of Professional Journalists 2006 Excellence in Journalism Competition. The Whitworthian also won the Outstanding Achievement in Student Journalism Award in 2005. The Whitworthian has served as the main source of news and sports coverage for the Whitworth community since 1905 and is run entirely by students. The newspaper's print edition is produced weekly, and online content is updated daily at http://www.thewhitworthian.com. Founded in 1909 as Sigma Delta Chi, SPJ promotes the free flow of information vital to a well-informed citizenry; works to inspire and educate the next generation of journalists; and protects First Amendment guarantees of freedom of speech and press. For more information about SPJ, please visit http://www.spj.org. James McPherson, associate professor of communication studies and adviser of The Whitworthian, Whitworth University, (509) 777-4429 or jmcpherson@whitworth.edu.